Recorded Live at Morumbi Stadium, Sao Paulo, Brazil - April 13, 2011. Excellent Soundboard / FM Broadcast Recording :: Silver CDs :: MP3 CBR 320 kbps & FLAC. Files: 25. :: Size: 306.45 MB (mp3)| 864 MB (flac). 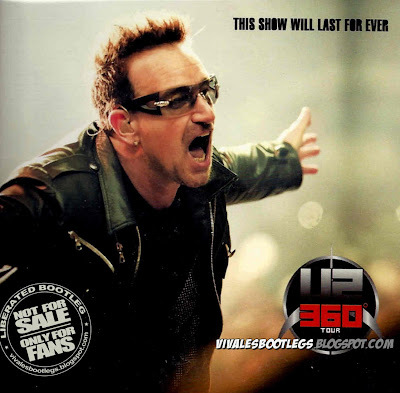 Notes: This Show Will Last For Ever is another great Godfather U2 release in their on-going series of documents from the massive 360° tour. This show is broadcast on South American radio and streamed online for U2.com subscribers and is the source used. It’s very clear and enjoyable and one of the label’s best efforts. Spin magazine reviewed the Saturday show, pointing out that: “On Saturday night as U2’s 360 Tour became the highest-grossing show of all time ($558 million and counting, surpassing the Rolling Stones’ A Bigger Bang tour in 2005-2007), money was not on anyone’s mind as the sonic exoskeleton spider crawled into São Paulo’s Morumbi Stadium with a heavy heart. The Wednesday night show is notable for Brazilian singer Seu Jorge joining Bono to sing a cover of Kraftwerk’s “Das Model” with Edge on acoustic guitar. 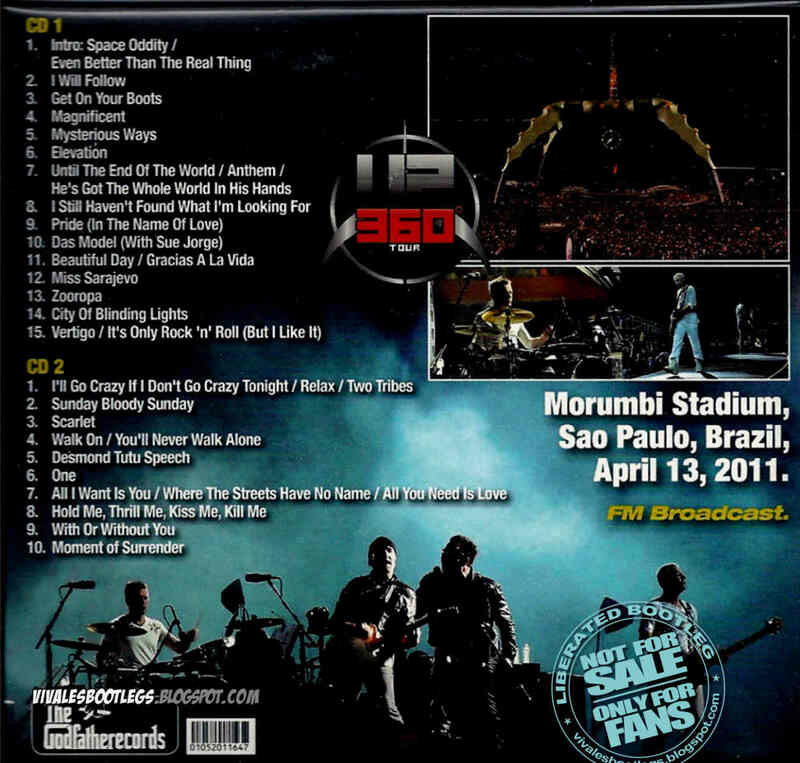 During the intro to “Beautiful Day,” a fan comes on stage and recites the lyrics in Portuguese. Bono struggles with his voice during parts of the show, and asks the audience to help sing during “I’ll Go Crazy.” Bono again dedicates “Moment of Surrender” to the children who died in last week’s school shooting in Rio. This Show Will Last For Ever is another excellent U2 release on Godfather worth having. <-(Info taken from collectorsmusicreviews.com). Thank you for posting. Please check the .txt files - I believe they are mixed up. The mp3 labeled files point to the flac archives and the flac text files point to mp3 files.